I mentioned that we started up to see the Space Shuttle launch last week, but it was scrubbed because of a hydrogen leak. We decided to give NASA a second chance. The only big change we made was to cancel our old room reservations and book a new room in Clermont so we’d be closer to where I was planning to ride the next morning. We decided to give Robert Nicol Park due west of the launch site another chance. Let me go on record that Robert Nicol Park must have the cleanest restrooms on the Space Coast. They have to be clean because they were locked. On a Sunday afternoon when hundreds of people were going to show up. The park has limited parking, but plenty of room for people to spread out. We picked a shady spot on a slight rise away from the water’s edge. I figured a couple of trees would look good silhouetted in the launch gl0w. Besides, I didn’t know exactly where the Shuttle pad was, I didn’t HAVE to produce any art and I’d rather be cool than sunburned. 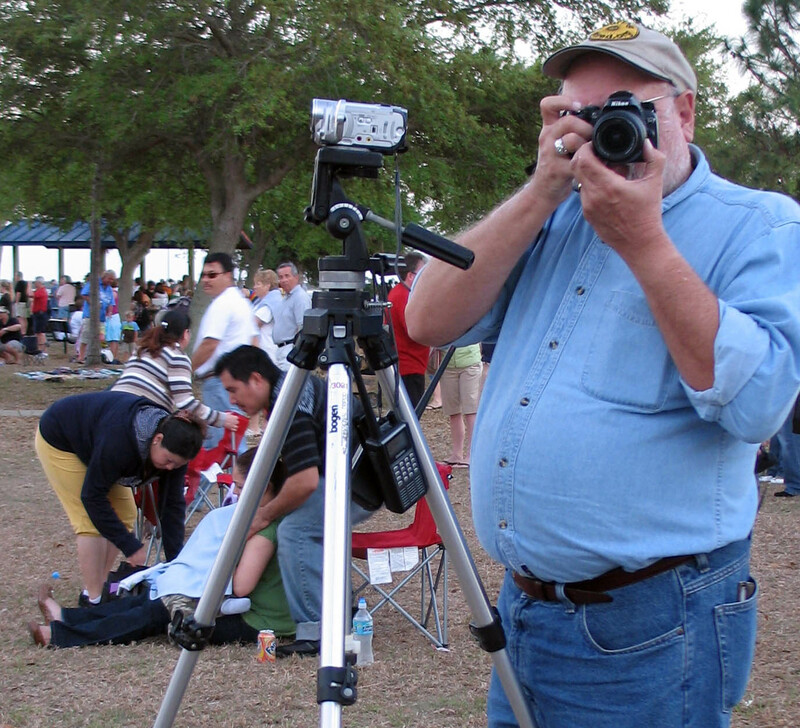 In addition to stuff to drink and some folding chairs, I brought along a tripod for the video camera, my Nikon D40 and two portable scanners. I used one scanner to monitor a ham radio rebroadcast of NASA updates and another than scanned a number of freqs used by the Kennedy Space Center. That proved really useful a few years back when I heard NASA talking about a problem that could cause the launch to scrub. As soon as I saw that a postponement was likely, we started packing up to boogie down the road before the official announcement was made. Radio traffic was very routine. There was some concern about a large freighter that was on a heading that would take him close to where the expended fuel tanks would drop, but the captain was contacted and he slowed his speed to be out of the zone at launch. The shuttle launched at 7:43 PM, and almost as soon as the shuttle cleared the treeline, we saw our neighbors heading to their cars. We couldn’t figure out why, but we’d soon learn. In the meantime, though, the show continued. There’s still plenty to see. We watched the external fuel tanks drop (hope that freighter WAS out of the way) and couldn’t believe the beautiful colors the setting sun was painting on the spreading contrail. We started packing up and dragging our stuff back to the car. The parking lot was about half empty. Traffic was heavy on the main road, so I decided NOT to go south to pick up the 528 like we had planned to go west to Clermont. I figured we’d go north and let my GPS calculate a new route. We hooked up with Jan on the FRS radio and told her about our route change. We did great for a couple of miles then we hit a parking lot. After about 30 minutes, we came to a cross road where a jillion cars wanted to go home just like we did. They were taking advantage of any break to jump out. We couldn’t figure out why nobody was directing traffic. Then we figured it out: there was no place to direct the traffic to go. It was solid gridlock. NASA radio broadcast a bulletin prior to launch telling everyone what to do if the Shuttle exploded close to the ground, and you saw a cloud of toxic fumes coming toward you. Based on what I saw, the answer is, “Hold your hand up in the air and say, ‘I’m coming, Lord’,” because you have about as much chance of escaping as that bat clinging to the fuel tank. Jan said it was time for a bathroom break and opted to go a different route that she swore was faster. We soldiered on. At one point, we disregarded the GPS and gambled on an alternate track. That just put us on a road with a net loss of about 12 miles. Jan wasn’t doing well, either. She was caught in another traffic jam. When she finally made it to a gas station, she encountered another form of gridlock: long lines at the restrooms. Women commandeered the mens’ room. When the tieups hit about the two-hour mark, we passed a score of cars where the passengers – men and women – had stopped on the side of the road to take “natural breaks.” The longer the tieup, the less modest the breaks became. I didn’t actually SEE anyone hanging out a car window, but I DID have to turn on my windshield wipers at one point. What’s the parallel to Disney World? When the kids were little, I remember standing in line two hours for a 45-second ride. NASA has the whole process reversed: you get the 45-second ride at the front end and THEN you have a four-hour wait in line. It was after midnight when we finally got the 60 miles to our room. I stuck my Surly Long Haul Trucker inside the van while we were watching the launch. I didn’t want to tempt anyone. If I had known about the traffic jams, I probably could have gotten to the motel faster on a bike. I surely would have enjoyed the trip a lot more. I would have beat you to the room by 30 minutes — no lie — had I not waited in that line at the gas station (and backtracked to get there). One woman was even eyeing the janitor’s closet and its sink. Next time, if there is one for me, I’m booking a room far north — seemed everone was headed west, and mostly so they could get on I-95 (which they shut down!) or the Turnpike to go south: I’m convinced the entire cities of Miami, Fort Lauderdale and West Palm were in cars leaving the Space Coast – not to mention half of Michigan, Arizona, Pennsylvania and Ohio. Wait…are you telling me the Shuttle took off again? Guess I missed that in the news, was it even in the news? And I thought I had it bad traveling 4 miles in one hour due to a stupid St. Patrick’s Day parade here in St. Louis. I mean really, 80 degree weather here and folks decided to waste it by wearing green, drinking warm beer and begging for cheap green plastic beads? The rumors are true, the end is coming in 2012, if not sooner. I don’t remember it being this bad the other times I’ve gone up. Maybe shuttle watching is like childbirth, if you could remember all the details, you’d only go through the process once. 2012 was my original target retirement date. Now that my first SS check is supposed to arrive next month I’d rather not see the world end quite so quickly. 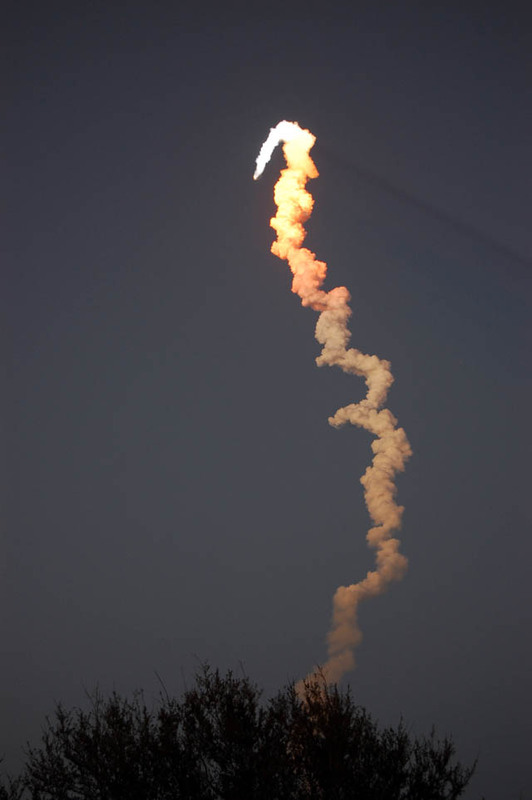 If you think a shuttle launch is bad, you should attend the Daytona 500. You did 60 miles in four hours. That is great speed. Val and Mac attended a race in Daytona — it may not have even been the Daytona 500 but a smaller race. It took them nearly nine hours to get to their home on the east side of town. 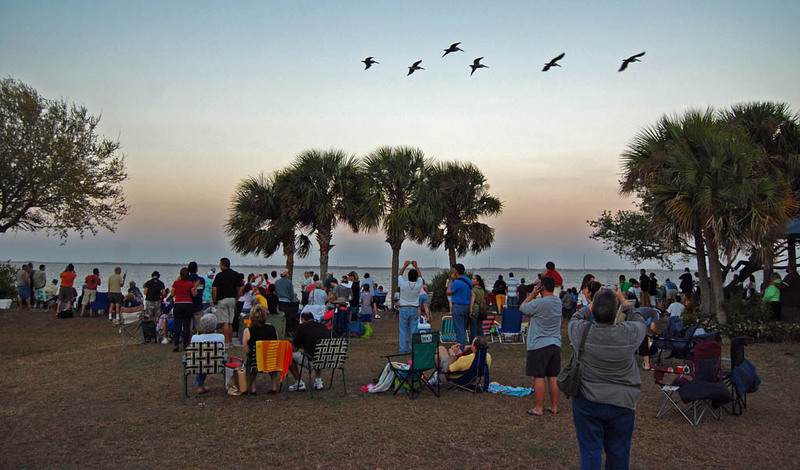 You drove 140 miles to watch the launch from behind a tree? 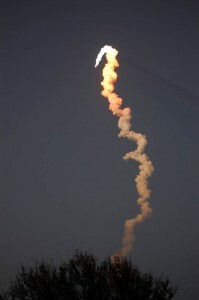 We missed the first few seconds of the launch for the same reason here in Lantana. 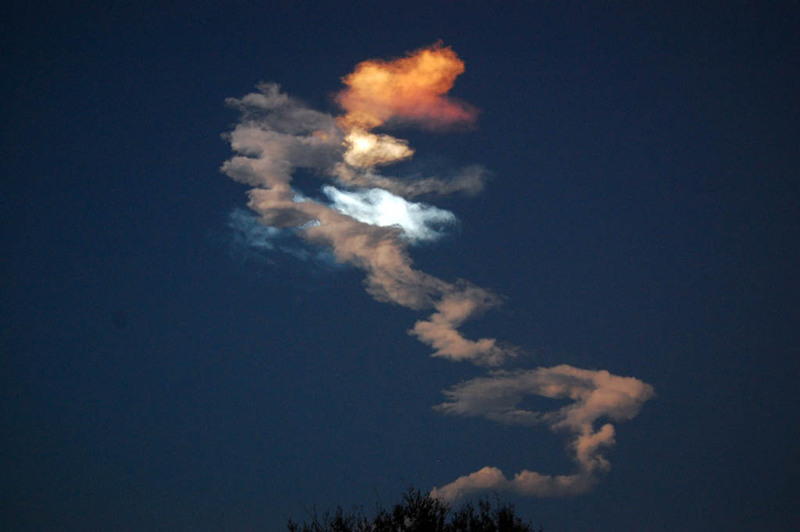 Love the colors of the smoke contrail. the;y made for a very neat sunset. 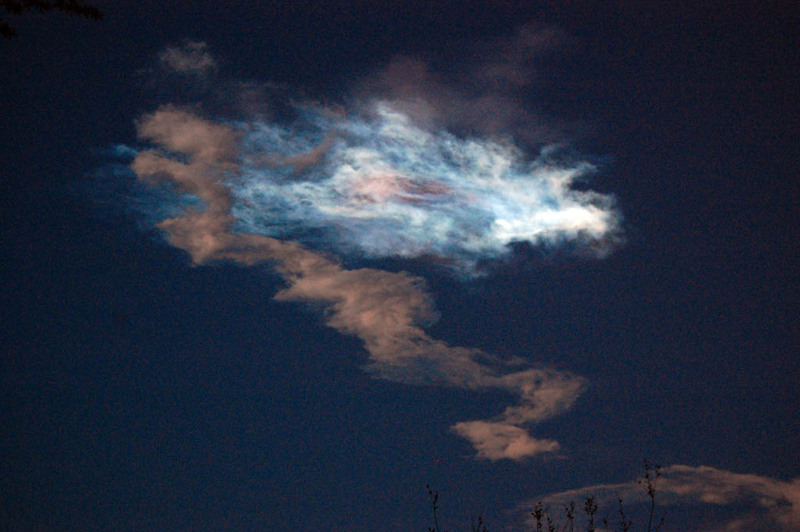 Could you see the shuttle itself, or just flame, as seen in the video? I’m surprised the traffic was so bad. The park didn’t look packed like I’ve seen in photos from Apollo and other launches. But now I know why we used to see lots of photos of campers and tents. Those folks can nap while the traffic goes away. Where did you ride in Clermont? There’s a “rails-to-trails” trail near there I want to check out the next time I’m up that way. Steinie chose not to walk over to the water to re setup his tripod — our video about 5 yards away shows the whole thing start to finish. Too much smoke and fireball to see the shuttle much without a lunar lens — neither of us have one. If it had gone off later at night or not at spring break (or the economy was better and fewer people were on unemployment time) I don’t believe traffic would have been so bad. Sunday night traffic headed south is usually heavy anyway. It was only annoying the first two hours. After that it was so surreal it was funny. The lack of gas stations or pit stops those first few miles was problematic. Remarkably, though, no one I saw was honking horns or acting stupid about letting people in or out. Very polite group all around. I-95 was likely a different story. I got caught in traffic twice like this before — once Weds. night before Thanksgiving on I-75 when a wreck shut down north lanes for four hours; and during the bicentennial fireworks on the beach in Fort Lauderdale. That was trippy. I set up behind the tree for artistic purposes. If I had stayed zoomed out, it would have looked better. I also didn’t know exactly where the pad was and the place I set up was in the shade. I anticipated a lot of people crowding around at the water’s edge and I thought it was less likely my view would be blocked from my vantage point. In addition, I didn’t want to have to move all my stuff at the last minute. I could see a good opportunity for crooks to grab stuff while everyone was looking skyward. As far as the trail near Clermont, watch this space. I started in Clermont and rode to Winter Garden. If I had had time, I could have ridden the whole West Orange Trail from Clermont. It’s very pretty, has lots of shade and has enough rolling hills to be fun without being a killer. I recommend it highly. Given a choice, I’d ride west to east on the extended W Orange / Clermont trail.